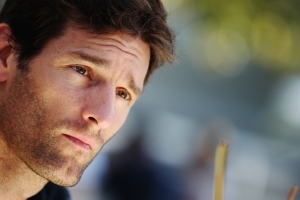 In a shocking revlation it was learnt that Mark Webber of Red Bull had been driving with a broken shoulder in the last four races of the season.This eventually cost him his lead in the championship, and paving way for his team-mate Sebastian Vettel. All his happened due to an injury which we got as a result of mountain biking accident, it was revealed in his book published in Australia. In all this drama his team boss Christian Horner was kept totally in dark about all that, only his physio Roger Cleary and F1's chief medical officer Gary Hartstein knew about it. In an interview to Daily Telegraph he mentioned :"I did'nt even know about the book,let alone the shoulder". "It is obviously disappointing that Mark said nothing. It was an injury that did not appear to have any effect on his performance but all the same it would have been nice to know about it.". This injury took place after the Singapore Grand Prix. He was treated by steroid based cortisone injections before the races in Japan and Korea to fade-up the pain and his fracture was fine enough and avoided major treatment.This made it the second time when he had got injured in less than two years, and that too because of training on mountain bike. Last time he sustained heavy fracture in his right leg as well as a broken shoulder.It happened in November 2008 while taking part in an adventure challenge of his own in Tasmania. He kept that injury a secret from his team and the public. In his book,' Up Front-2010, A Season to Remember' he told made major revelations in which he quotes:"On the Sunday morning before (the Japanese Grand Prix at) Suzuka, I got on a mountain bike for the first time since my accident in Tasmania at the end of 2008. "I was riding with a great friend of mine. Suddenly, he crashed right in front of me and I had nowhere to go but straight through the ears of the horse! "I suffered what they call a skier's fracture to my right shoulder. "Suzuka is a brutal track so it was a blessing that the Japanese weather gave me an enforced rest day on the Saturday (when qualifying was rained off), and a pre-race injection helped, too. "In the end, we got through the weekend all right." By the time of accident, he was in total command of the world championship leading by 11 points from Alonso and 21 ahead of the German Vettel. At Japan he finished second to Vettel, whereas the German was 0.07 seconds faster in qualifying. But he got a major blow in the subsequent race in Korea where he got substantial loss in the second racing lap. As a consequence Alonso won the race, allowing him to surpass Webber by a 11 point lead. He then finished second in Brazil , there which Vettel got the first place before losing any hope of regaining the lead with an uncompetitive performance at the final race in Abu Dhabi.